A useful activity that greatly helps assimilation is making notes for yourself. To allow you to make and save your own notes online, we have created an online 'Personal Notepad' (PEN) for you. These personal notes are an excellent revision tool when you return to review any of your lessons. To become fluent in English, you must gradually lose your dependency on translating words and phrases into or from your native language. Therefore, you need to make a habit of looking up new words in an English-English dictionary instead of a bilingual dictionary. Of course, sometimes, you want a quick translation to be sure you have understood correctly, and that is fine. 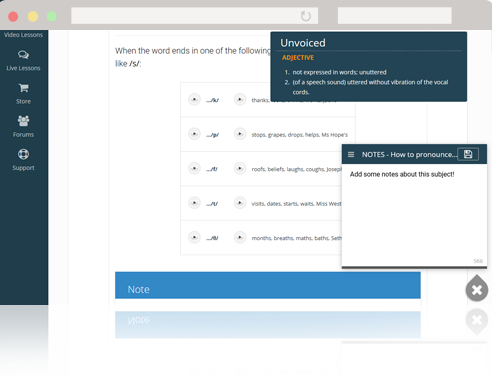 To help you study in the most efficient way, we have incorporated an English-English dictionary and a translation tool into the platform so you do not have to leave the page you are studying.